Traveling to Peru is prioritizing; as there is so much to see and do and most travelers have limited time, a question that often comes up is whether it is best to have one or two days at Machu Picchu. This is of course not an easy question to answer but there are some tips one can take into consideration if you would find yourself with this dilemma. Time Slots Since 2018 there are some new rules for visitors to Machu Picchu, one of the most important ones being the implementation of time slots for visitors. Before the tickets were valid for a whole day but nowadays you have to purchase a ticket for either the morning (6.00am till 12.00pm) or the afternoon (12.00pm till 5.30pm) slot. If you buy the morning slot they will let you in till around 11.00am and you can stay the time you would like. However, please keep in mind that you can only re-enter with your ticket before the end of your time slot. This is important in case one would have to use the restrooms which are located at the entrance of the site. If you have a ticket for the afternoon slot you will be allowed to enter the site from 11.00am onward and can re-enter till 5.00pm. If your train therefore would arrive on the same day as your visit you will most likely not be at the entrance before 10.00am and therefore it is to opt for the afternoon slot in this case. Crowds From the last visitors review it can be seen that about 60-65% of the daily visitors visit Machu Picchu before 1.00pm. This means that the afternoon slot for most days is a lot less crowded. A lot of people want to see the sunrise over Machu Picchu and therefore head up to the site for the opening time at 6.00am. Nevertheless it must be noted that as Machu Picchu is located in cloud forest for a lot of days throughout the year the sunrise will be blocked in the early morning. Seeing the sun coming down over Machu Picchu with less crowds than the sunrise may therefore be an option to consider instead. Buses In order to get from Aguas Calientes where your train arrives to Machu Picchu, one has to take a 30 minutes bus drive over the hairpin Hiram Bingham Road (or hike for about 2 hours). The bus service operates daily from 5.30am (first bus) till 5.45pm (last bus). Buses fill up and depart with the next bus right behind in both directions. Nevertheless due to bad management, during “rush hours”, especially in the high season (May through September), the waiting time to get on a bus can be up to two hours. Unfortunately there is no way around this as the buses only work with a first come, first serve system and spaces cannot be reserved in line or in the buses. “Rush hour” runs more or less from 5.00am till 9.00am and from 11.00am till 1.00pm for the bus to Machu Picchu and from about 11.00am till 1.00pm and 3.00pm till 5.30pm for the buses back down to Aguas Calientes. In the low season the waiting time will be a lot less but still it is best to consider at least 30 minutes waiting to get on the bus throughout the day and 1 hour for the early morning departures. In case you would like to see Machu Picchu at sunrise, for the high season (May through September) it is recommended to be at the bus stop around 4.30am. Hiking Apart from the normal circuits for the visits to Machu Picchu (with the new regulations they also implemented obliged routes to follow when visiting the site) there are also some additional hikes and walks one can do at Machu Picchu. These are; hike Huayna Picchu (HP), hike Machu Picchu Mountain (MM), hike to the Sun Gate (SG) and visit the Inca Bridge (IB). The first two (HP & MM) are hikes for which an additional entrance ticket is needed and which are limited to 400 visitors daily. These 400 visitors are divided over two time slots; HP 7.00am and 10.00am & MM 7.00am and 9.00am. Therefore as you can see these hikes can only be visited in the morning. This is very important to take into consideration when visiting Machu Picchu for one; it is virtually impossible to travel to Machu Picchu by train on the same day as doing either of these two hikes. Therefore if one of these hikes is important to you need to have either a two day visit or arrive to Aguas Calientes the night before your visit. The latter two hikes (SG & IB) can be done all day long and do not require an additional ticket. Weather Another factor you may want to consider when deciding on how many days to visit Machu Picchu is the weather. Machu Picchu is located in Cloud Forest meaning that the weather in general is quite hot and humid. The high humidity and proximity to the Andes also makes that this location has a very active weather patron meaning that the weather can change quite rapidly and several times in a day. One moment Machu Picchu can completely disappear in the clouds and the next moment all the clouds disappear and you have clear blue skies. The same goes for rain. Due to its location Machu Picchu can have rain all year round and showers can appear out of nowhere. During the dry season there is less rain in general but cannot be excluded either. Mostly these showers do not last that long but days that are mostly covered in rain are possible. Therefore, especially when traveling in the rainy season it may be worth considering an additional day at the site increasing your chances of having good weather. Guides With the new regulations mentioned, another important change is the fact that nowadays for first time visitors it is obligatory to have a guide with them. The theory behind this is that the guide will inform the first time visitors about the rules and regulations making them aware of what is and what is not allowed. Accredited guides can be hired at the entrance but please keep in mind that there are very good guides but also less good ones. You enter together with the guide and the system registers this. If you would then have a second day visit the system recognizes that you had a guide for the day before therefore will not require you to have a guide with you for this second visit. Please keep in mind that for visits with more than 2 days in between this is not valid. Conclusion? So after reading all this, what is the conclusion? Well first of all this remains a personal question as it depends on the importance Machu Picchu has for you during your trip. 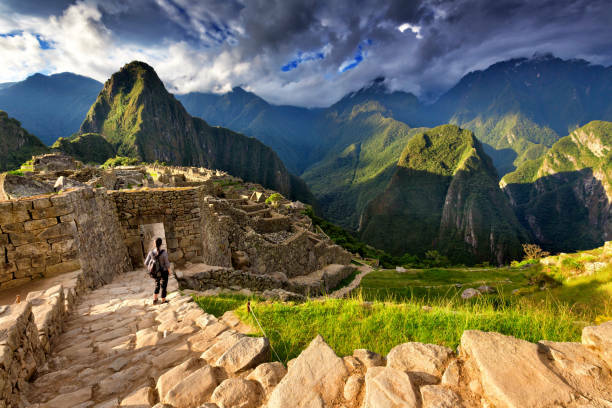 Assuming Machu Picchu is the highlight of your trip our recommendation would be two days. This would allow you grasp the best of Machu Picchu as well as enjoy the beautiful train journey to and from Machu Picchu during daylight. On day one you can travel with one of the later morning trains to Aguas Calientes, pass by your hotel to drop off any excess luggage and head to the site where you will arrive around noon, in time to enjoy the whole afternoon at Machu Picchu with less crowds. This also makes for a nicer guided visit. Around closing time in the afternoon you can head back to Aguas Calientes and your hotel. On day two you can enjoy Machu Picchu during the morning slot and head up with one of the early buses. This day you would no longer need a guide for your visit. Day two you can therefore focus on doing one of the hikes mentioned above and even combine this with a visit to the Inca Bridge. In the early afternoon you can then head back down to Aguas Calientes and take an afternoon train back to Ollantaytambo or Poroy Station. Our experience is that this program would allow you the best Machu Picchu experience.